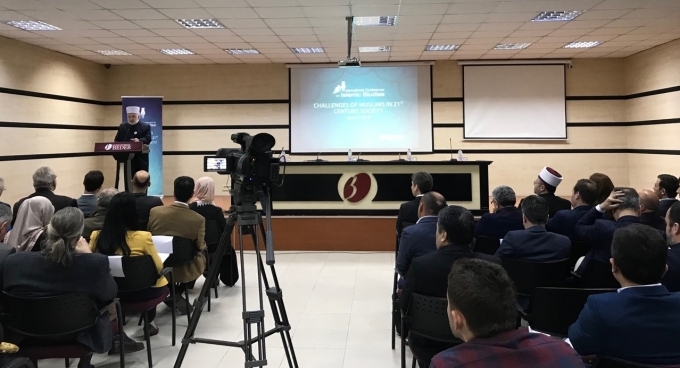 Today, the Islamic world and Muslims living in non-Islamic countries are faced with many external and internal challenges it is our responsibility to find a solution and to serve it to all Muslims in order not to fall back on these challenges. Grand mufti Emeritus of Bosnia Mustafa Ceric, Ph.D., Kep Advisory Commission Chairman, was Keynote speaker at the 1st International Conference on Islamic Studies at the invitation of the Rector of the University College Bedër in Tirana prof. dr. Ferdinand Gjana, on Islamic Studies with a very challenging topic: Challenges of Muslims in 21st Century Society. 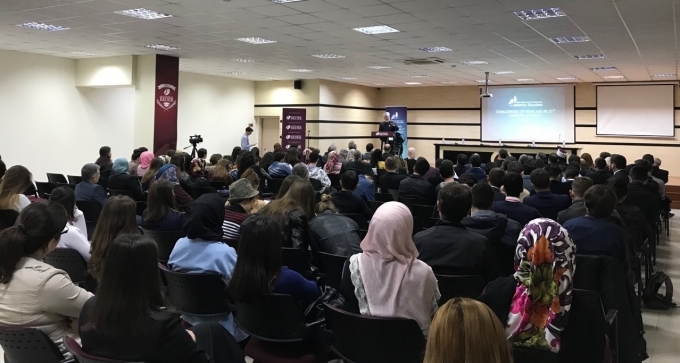 The conference was held in Tirana, Albania, on April 5th, organized by Bedër University. 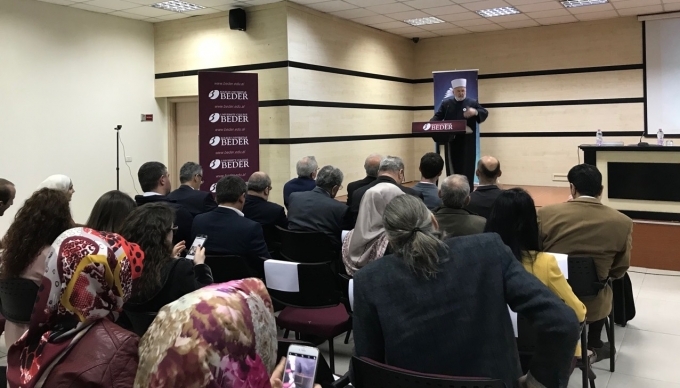 I am honored by the invitation of the Rector of the University College Bedër in Tirana Prof. Dr. Ferdinand Gjana to attend this 1st international conference on Islamic Studies with a very challenging topic: Challenges of Muslims in 21st Century Society. And I am challenged to speak about the Muslim challenge of this age. I am pleased by the presence of Grand Mufti of Albany here with us today H. E. Skënder Bruçaj, who fulfilled his promise a year or so ago in Abu Dhabi that he will invite me to Tirana. And here I am very grateful to have the opportunity to meet my brothers and colleagues in the Balkans and to speak with them about the Muslim challenges of our times. 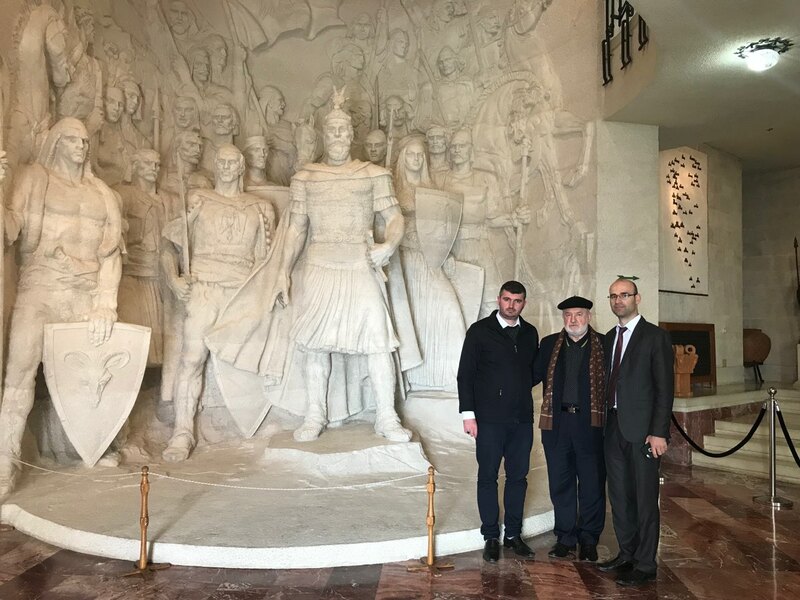 Thus, here I am as to witness the fulfillment of the promise of the Grand Mufti of Albania, who has already earned a great respect in the Muslim world as much as the great Albanian hero of the 20th century Shaikh Sabri Khoja, who deserves to be remembered not only as a hero of Albania, but also as a hero of the Balkans and the Muslim world as a whole for his human and Muslim faith perseverance in difficult times of the absence of religious freedom in the Balkans. /Al-Fatiha/. It goes without saying that it’s extremely important that we Muslims in the Balkans meet often to discusses our Islamic affairs and to be good example in promoting the faith of Islam in a truly reasonable way. The Albanians and Bosnians are not only the indigenous and authohton nation in the Balkans but also in Europe. Therefore, we have the right and duty to be on the frontrunners in explaining and defending the true meaning of Islam and the true nature of Muslims in the world. This is what the Muslim word expect from us to do and this is what Europe is waiting to hear from us to say our word about our inalienable human rights as we are trying to find our right place in the Balkan and European societies. We should invite our brothers from the Muslim world to explain our situation here, but also to give our important contribution to a betterment of the image of Islam and Muslims in the world. I speak here in the capacity of the Advisory Commission Chairman of the Knowledge Exchange Program with the headquarter in Riyadh, Saudi Arabia as well and I can say that our work in promoting the way of Wasatiyyah and tolerance of Islam is very appreciated by all people in the Muslim world who are committed to spreading the desirable peace and security in the world. 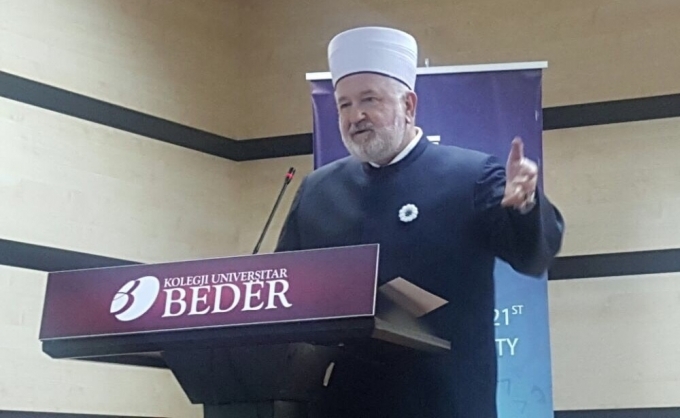 So, let me begin my presentation today by saying that, perhaps, I am not entirely eligible for the task you have delegate it to me today, but, for sure, the task is entirely a daunting one not only on me but also on all Muslims who are nowadays politically responsible and morally sensitive. Indeed, Islam and Muslims are in focus today, rightly or wrongly, more than any other world faith and faithful group not only in the world media but also in the world academia, politics and general public. As Shiraz Maher has observed, the Graeme Wood’s essay for The Atlantic in February 2015, titled “What ISIS Really Wants”was an instant success. It was the most read article in The Atlantic’s almost 160-year history and was the most read digital story of 2015 - receiving more than one million page views the day it was published. Some Muslim protagonists see this phenomenon of interest in Islamic affairs as a divine providence based on the Prophet Muhammad’s Hadith that this religion, meaning Islam, will reach everywhere in the world. عَنْ تَمِيمٍ الدَّارِيِّ قَالَ قَالَ رَسُولُ اللَّهِ صَلَّى اللَّهُ عَلَيْهِ وَسَلَّمَ لَيَبْلُغَنَّ هَذَا الْأَمْرُ مَا بَلَغَ اللَّيْلُ وَالنَّهَارُ وَلَا يَتْرُكُ اللَّهُ بَيْتَ مَدَرٍ وَلَا وَبَرٍ إِلَّا أَدْخَلَهُ اللَّهُ هَذَا الدِّينَ بِعِزِّ عَزِيزٍ أَوْ بِذُلِّ ذَلِيلٍ عِزًّا يُعِزُّ اللَّهُ بِهِ الْإِسْلَامَ وَذُلًّا يُذِلُّ اللَّهُ بِهِ الْكُفْرَ. 16509 مسند أحمد. Tameem Ad-Dari reported: The Messenger of Allah, peace and blessings be upon him, said: - This matter will certainly reach every place touched by the night and day. Allah will not leave a house or residence but cause this religion to enter it, and the honorable will be honored and the disgraceful will be disgraced. Allah will honor the honorable with Islam, and Allah will disgrace the disgraceful with unbelief. The staunch Muslim protagonists interpret this Hadith in the light of a unique worth of Islamic message which cannot but be noticed by everyone regardless of his/her attitudes towards it. These people say that the news about Islam through the major world media, regardless whether it be positive or negative, is a proof that Islam is worth of a serious attention of those who are friendly to it to strengthen their faith in it, while those who are unfriendly to it are being exposed to it to be acquainted with it despite their adversarial attitudes toward it. This reasoning is strange, but it is present in the minds of those who cannot accept that Islam is by any means wrong even if it appears to some that there is something wrong because of the acts of violence by some irresponsible groups who claim to act in the name of Islam or in the name of Allah. Those who have stung belief in Islam cannot have any doubt in the goodness, righteousness and tolerance of their faith of Islam. This conviction of a tolerant Islam is like a myth that cannot be eliminated from their conscience. حَدَّثَنَا الْوَلِيدُ ، وَرِشْدِينُ ، عَنِ ابْنِ لَهِيعَةَ ، عَنْ أَبِي قَبِيلٍ ، عَنْ أَبِي رُومَانَ ، عَنْ عَلِيِّ بْنِ أَبِي طَالِبٍ رَضِيَ اللَّهُ عَنْهُ قَالَ : " إِذَا رَأَيْتُمُ الرَّايَاتِ السُّودَ فَالْزَمُوا الْأَرْضَ فَلَا تُحَرِّكُوا أَيْدِيَكُمْ ، وَلَا أَرْجُلَكُمْ ، ثُمَّ يَظْهَرُ قَوْمٌ ضُعَفَاءُ لَا يُؤْبَهُ لَهُمْ ، قُلُوبُهُمْ كَزُبَرِ الْحَدِيدِ ، هُمْ أَصْحَابُ الدَّوْلَةِ ، لَا يَفُونَ بِعَهْدٍ وَلَا مِيثَاقٍ ، يَدْعُونَ إِلَى الْحَقِّ وَلَيْسُوا مِنْ أَهْلِهِ ، أَسْمَاؤُهُمُ الْكُنَى ، وَنِسْبَتُهُمُ الْقُرَى ، وَشُعُورُهُمْ مُرْخَاةٌ كَشُعُورِ النِّسَاءِ ، حَتَّى يَخْتَلِفُوا فِيمَا بَيْنَهُمْ ، ثُمَّ يُؤْتِي اللَّهُ الْحَقَّ مَنْ يَشَاءُ )رواه نعيم بن حماد رحمه الله في " كتاب الفتن " (573). When you see the black flags, stay where you are, don’t move your hands or your feet, and when some miserable people appear to you do not pay attention to them, their hearts are like the iron of the iron, they pretend that they are the owners of the state, but they do not abide by a covenant or a contract, they claim the truth but they don’t behold it. They have nicknames and their backgrounds are rural, their feeling is soft as the feeling of women, so much so that they disagree with each other very easily, but, then God will give the whole truth to whomever he wants. The staunch Muslim antagonists against extremists are applying this Hadith to contemporary extreme groups within the Muslim societies. Indeed, the Muslims who believe in an inclusive Islam are extremely embarrassed by the acts of violence, terror and intolerance in the name of Islam, but they are unable to stop these extreme protagonists who claim to be Muslims, but whose real identical background is unclear except that they act in the name of Islam or in the name of Allah. It seems that we are faced with an unprecedented phenomenon of the actors of violence on the global scene where no one knows their real identity or some know who they are but hide them because they must hide their own identities which, if somehow discovered, might be used against them in such a way to show the real actors behind this bloody circus on the world stage which is being labeled to Islam and Muslims around the world, and which is insane, stupid, silly, idiotic, and mindless. No, I am not seeking any excuse for any one. I just wanted to bring about these two Hadiths as an illustration of the state of Muslim situation today in terms of two opposite viewpoints about the present image of Islam and the present position of the Muslims in today’s world: one is missionary optimistic and the other is apocalyptically pessimistic. As I said, reading the first Hadith, the missionary optimistic people believe that the very talk or debate worldwide about Islam, whether positively or negatively, is a fulfillment of the Prophetic promise that Islam will reach every household on this planet, while those Muslims who are pessimist about the state of Islam in the world today read the second Hadith as a sign of a menace of the Muslim world, nay, of the future of Islamic civilization as a whole. Indeed, the Muslims are today before an Islamic civilizational challenge which is unprecedented in their entire history. Should I remind you of the fact that Islamic civilization is still a living civilization by a relevant account of Matthew Melko who made the total twelve world civilizations in history: “seven of which have vanished (Mesopotamian, Egyption, Cretan, Classical, Byzantine, Middle American, Andean) and five of which still remain (Chinese, Japanese, Indian, Islamic, Western)”. And, as Niall Ferguson, quoted: “Shmuel Eisenstadt counted six by adding Jewish civilization to the club”. Furthermore, Ferguson pointed out that: "The interaction of these few civilizations with one another, as much as with their own environments, has been among the most important drivers of historical change. The striking thing about these interactions is that authentic civilizations seem to remain true unto themselves for very long periods, despite outside influences. As Fernand Braudel put it: Civilization is in fact the longest story of all... A civilization ... can persist through a series of economies or societies”. (4) the commons of humanity itself, of the shared social political space: the more capitalism gets global, the more new walls and apartheids are emerging, separating those who are IN from those who are OUT. By this quotation I want to highlight two sets of the challenges of the Muslim societies today. They are external or global and internal or domestic. In other words, the Muslim societies are today in between an “IN” or an “OUT" of the civilizational frame of both an historical and contemporary advantage of it as being the holder of a prestigious title of a living civilization among the other living civilizations of today, especially the Western civilization as they two, the Islamic and the Western civilizations, stand, by all accounts, as Siamese twins in the world. Indeed, these two civilizations are inseparable and inalienable from each other no matter how mach some people from both camps would like to separate them or alienate them from each other. These two civilizations share all four Žižek’s commons: culture as an immaterial capital; threats of environmental pollution; biogenetic change of human nature; and social political space. Each of these four commons is important, but the commons of social political space, it seems to me, is the most challenging of all. Although, the external or global and internal or domestic affairs in the Muslim societies are strongly converging; and despite the fact that it is not always clearly recognizable as to which one of them is more influential on the overall Muslim social political development, I would say that the internal or domestic affairs are more challenging to the Muslim soul and mind today than the external or global ones. And, contrary to a common perception that the lack of a strong Muslim unity is the biggest obstacle to an overall Muslim stability and prosperity, I would say though that the lack of the clear notion of diversity in the Muslim theological and political thought is the key cause for a disturbance and even bloody violence in the Muslim societies. By far the Muslim faith and the Muslim faithful people are more united in their basic creeds than any other religious group in the world. Indeed, without exception all Muslims around the world have the same belief in the divine origin of the Qur’an, in the authenticity and eligibility of the last Prophet Muhammad, peace be upon him, in the right direction in Muslim prayers towards the K’aba in Mecca, in the right and same day of Arafat of the Hajj pilgrimage, etc. So, there is no Muslim disunity issue here in regard to their basic Islamic creeds. Hence, the Muslims should spare time taking about unity which is obviously there. Instead, the Muslims should start talking about the fact of their diversity, which is obviously there as well, but which is not rightly recognized in the sense of a creative and enriching way as it should be and as it has always been. Therefore, the biggest challenge of the Muslim societies today, as I see it, is to learn how to live the unity in diversity of their ethnic, national, racial, cultural and political background, indeed, their abundant creative potentialities. In short, the Muslim societies today must learn how to respect each other’s diversities as much as they love each other for the sake of their having the same faith and culture identity. This, indeed, is more challenging than anything else, namely, it is more challenging today to appreciate the Muslim diversity than to insist on the Muslim unity as an empty propaganda that leads some Muslim individuals and groups to a cheap populism and demagogy. Let me say, then, that if Muslims were to respect each other’s life, faith, freedom, property and dignity as much as they love each other because of their common belief in God, in the Angels of God, in the Books of God, in the Prophets go God, in the Last Day of Judgement and in the final God’s decree of their ultimate destiny, their societies would be a lot better in terms of their cultural and social political life, which they share with others as well, and they would be a lot better in their self-sufficiency of cultural, political and civilizational development. And the second challenge that is on the Muslim mind today is somewhat a new phenomenon but an old pattern of an intentional mis-interpretation and mis-presentation of Islam and Muslims in the world. Therefore, this new phenomenon got a new name as well - islamophobia. It is not entirely clear what islamophobia means, but it is, no doubt, aimed to embarrass Islam and Muslims around the world in whatever way possible. It is similar to anti-semitism, but it is not the same. It is not racal, but it has something to it; it is not cultural, but it has something to it. It is like bigotry, but it is not fascist. It is simply antagonistic to the presence of Islam and Muslims in certain places in the world. Indeed, islamophobia is a fear from unknown, which is known as Islam, and which is labeled as Islamic, Islamist, Jihadist, Salafist, Wahhabist, Terrorist, etc. Again, contrary to a common perception that islamophobia is meant to frighten or terrorize or even to proselytize Non-Muslims around the world, especially in the West, I would say that the islamophobia is primarily meant to frighten and inflict a kind of pain on the soul and mind of Muslims around the world. Non-Muslims, particularly Jews and Christians in the West, have no reason to fear either from Islam as a pure faith or from the Muslims as true faithful people. These tree correlative monotheistic religions, the religions of God’s Books, have accommodated each other through sweet and bitter experiences throughout a long history and, thus, they know exactly the potentials of each other and, thus, they are aware of the fact that there is no alternative to their common coexistence by an inevitable mutual respect as to have and to hold forward, for better, for worse, for richer, for poorer, in sickness and in health, to work together for peace and to cherish each other for good of all, till death do them part. All these three religions have learnt by now that the heirs of this earth will be neither the meek nor the aggressive, but cooperative. Say to them Muhammad: - Pray to God Almighty or pray to Rahman, the most Merciful, and you may pray to any of His beautiful names, but don’t be either overloud in your prayer or over-shy in it. Instead, you follow the right way, the middle way in your prayer. Indeed, the truth doesn’t need to be overloud because it is truth. The lie needs to be overloud to silence the truth. Islam is truth, peace and tolerance. Therefore, it doesn’t need to be overloud to irritate others or to terrorize them in whatever manner. 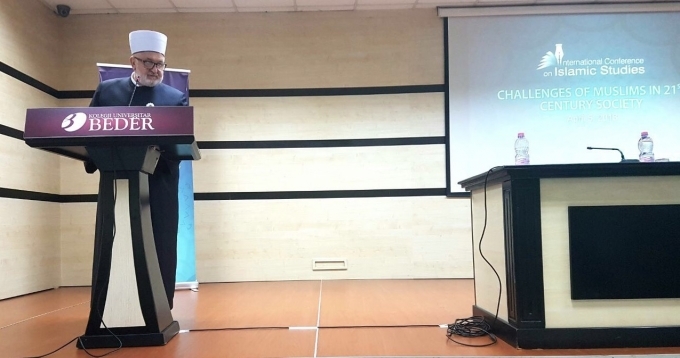 In conclusion, then, I would like to say that the Muslim societies today have two biggest challenges of all: one is the unity in diversity and the other is islamophobia which is aimed at them to alienate them from Islam both as faith and culture. Indeed, I see the latter challenge, the islamcphbia, as a Muslim self-alienation, as the most pressing challenge of all. It is not because there is something wrong in Islam or in Muslims, but because we live in the world today which is as “topsy-turvy world” as it was in the time of Hegel, who stated in one of his most bizarre passages in the Phenomenology, that this world is topsy-turvy world where sweet becomes sour, white becomes black and north becomes south. The inversions cover moral laws as well as natural ones: honor becomes contempt and punishment becomes pardon (PS, §158). •	If you think deeply about the conditions of people, you will find those who are most concerned with the faults of others to have the most faults themselves. And this is our message to all islamophobia people wherever they are and whoever they might be.